A study published in the Canadian Journal of Fisheries and Aquatic Sciences* found that while the amount of tuna aggregated around a floating object can vary widely from a few tons to several hundred tons, the amount of non-tuna species is far less variable, typically ranging from a couple of hundred kilos up to a few tons. This mans the amount of bycatch is more or less constant when compared to tunas. Furthermore, the total amount of unwanted fishes in an aggregation is entirely unrelated to the size of the tuna aggregation. So, what does this mean? Researchers concluded that fishing both small and large tuna aggregations at FADs will result in a similar total amount of bycatch. As a result, the total bycatch per vessel at year end is directly related to the number of sets made as opposed to the total amount of tuna caught. The same applies to silky sharks, a bycatch species that is particularly vulnerable to overfishing and deserves specific conservation attention. Therefore, one easy solution for reducing bycatch in this fishery is to avoid setting on small aggregations. Using data collected by observers onboard purse seiners in all oceans, scientists determined that avoiding sets on schools of tuna less than 10 tons would reduce the amount of bycatch by 23-43% depending on the region, while only reducing the total amount of tuna by 3-10%. Such a practice would also result in a reduction in the catch of silky sharks by 21-41%. Through the avoidance of sets on small schools, the fishery would improve its efficiency both through reductions in the ratio of bycatch to catch, as well as through an increase in the average set size. Ultimately, this is just one tool fishers can use to eliminate unwanted catch. *Source: Dagorn L, Filmalter JD, Forget F, Amandè MJ, Hall MA, Williams P, Murua H, Ariz J, Chavance P, Bez N, 2012. 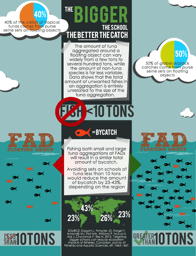 Targeting bigger schools can reduce ecosystem impacts of fisheries. Canadian Journal of Fisheries and Aquatic Sciences, 69: 1463-1467.